© 2019 Bert Radke. Some Rights Reserved. Opencorporates recently made the German cooperate data publicly available. What better moment to learn how to import data into neo4j? There is an improved version of the import in a followup post. Utilizing the APOC extension, one can load the data from various sources (HTTP, file) in JSON, CSV or XML format. The corporate data is available in JSONL format, which means that each line in the file is a JSON object. The lines are not bound together into an array. 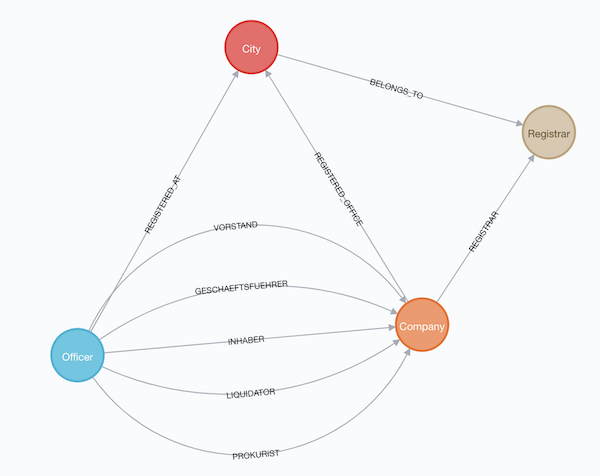 After playing around with the imported data, I decided that the City and Registrar nodes do not add any value for me and removed them as nodes, resulting in a schema that only consists of Company and Officer notes. This is using the jq JSON tool to parse out the position values. Since jq does not work with JSONL, I formed one big array using sed. About 5.3 million lines aka companies. Throwing all of this at neo4j in one block would require a lot of memory as the JSON would need to be parsed and converted. Also, the transaction would be rather large, adding to the needed memory. Needed gsplit, as the split on the mac is a missing some of the options needed. We now have the data in digestible chunks and can start importing. I used python -m SimpleHTTPServer to serve the files via HTTP. 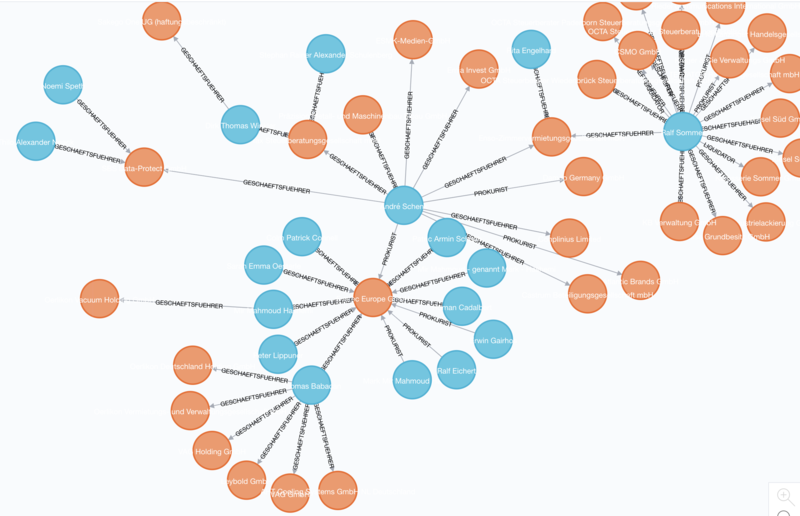 Putting them into the neo4j import folder should have worked as well. apoc.periodic.iterate accepts 2 cypher queries, iterating as long as the first query produces values and providing the output of the first as additional parameters for the second query. After each iteration, a commit is performed. The foreach around the relation merges is a hack since relation types cannot be dynamic. The import of the 4GB data took on my MBP about 10 minutes. Not toobad. With the data in place, one can now start exploring. The image right at the top shows the companies of some far-right Germans. Searching for a company called "Schulenberg & Schenk" I came up with the mesh of companies below. They are a law firm that I received a letter from a few years back, claiming some copyright infringement. They are 'famous' in Germany for sending out adhortatory letters on behalf of the pornographic industry. I did win that lawsuit.